A simple puzzle cache that involves a bit of on-line research to find the final coordinates. 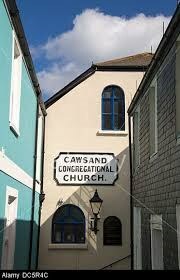 It is strongly recommended that you solve both Cawsand Church Micro Puzzles before embarking on a visit to the GZ. The cache is NOT at the headline coordinates - you do not need to hire a boat to visit them!! The origin of Congregational Churches dates to the time of Henry VIII ‘s creation of the Church of England. A number of Christians felt that the new Church of England was as bad as the Catholic Church in that a central authority dictated how churches were run and defined the rituals associated with worship. A theologian named Robert Browne published a theory of union which, at its core, proposed that churches should be run by their congregations. It emphasizes the right and responsibility of each properly organized congregation to determine its own affairs, without having to submit these decisions to the judgment of any higher human authority, and as such it eliminated bishops and presbyteries. Each individual church is regarded as independent and autonomous. This tract had the snappy title: “A Book which sheweth the Life and Manners of all true Christians”. This publication is considered to be the founding basis of the Congregational movement. The villages of Kingsand and Cawsand were two adjacent small villages divided by a small stream that was the original Cornwall and Devon border. Cawsand being in Cornwall and Kingsand in Devon. The main wealth of the villages derived from servicing ships moored in the shelter of Cawsand Bay and from smuggling. In the 18th Century the first Congregational Church was built on a piece of land overlooking the sea which had previously served as a fort to protect the village from marauding French and Spanish ships. The Church is accessed down a narrow passageway between two houses off the main street known as Garrett Street. The church has an active team of supporters who make it an important part of the local community. 1. In which year did the Robert Browne treatise get published in Middelburg in the Netherlands? (Beware, some references have the date 10 years after the correct date!!). This gives you ABCD. The cache is located on a public footpath and offers a nice view of the Congregational Church. The cache is a camo'd tube about 10 cms long and 3 cms in diameter. Tree cover may be a problem here but the hint should point you in the right direction. Cnff guebhtu guerr pbapergr cvyynef - onfr bs gur arkg pbapergr srapr cbfg ba gur yrsg.